By the late 1980s, the Mirage 2000 was beginning to age compared with the latest models of U.S. F-16 fighters, so Thomson-CSF began work on a privately funded update of the Mirage 2000C which was to be named the Mirage 2000-5. A two-seat Mirage 2000B prototype was extensively modified as the first Mirage 2000-5 prototype, and it first flew on 24 October 1990. A Mirage 2000C prototype was also reworked to a similar standard, making its initial flight on 27 April 1991. The production aircraft entered operational service in 1997. A two-seat version was developed as well, whose rear seat has a HUD but not an associated head-level display and lacks a built-in cannon, although cannon pods can be carried. Improvements included the Thales TV/CT CLDP laser designator pod as well as the Thales multimode RDY (Radar Doppler Multitarget), which allows detection of up to 24 targets and the ability to simultaneously track 8 threats while guiding 4 MICA missiles to different targets. Updates to defensive systems included the ICMS 2 countermeasures suite and the Samir DDM missile warning system. ICMS 2 incorporates a receiver and associated signal processing system in the nose for detecting hostile missile command data links, and can be interfaced to a new programmable mission-planning and post-mission analysis ground system. Avionics were also updated, using a new Night vision-compatible glass cockpit layout borrowed from the Rafale, a dual-linked wide-angle Head-up display, and HOTAS controls. The Mirage 2000-5 can also carry the oversized drop tanks developed for the Mirage 2000N, greatly extending its range. Dassault needed an order from the AdA to help promote foreign sales and, in 1993, the AdA decided to upgrade 37 of their existing Mirage 2000s to the 2000-5 specification as a stopgap before the arrival of the Rafale in AdA service. The upgraded aircraft were redesignated Mirage 2000-5F, and became operational in 2000. They retained the old countermeasures system with the Serval/Sabre/Spirale units and did not receive the ICMS 2 system. The AdA is now considering upgrades for the type, including the MIDS datalink, MICA IR support, and the Thales Topsight helmet-mounted display and sighting system. In 1992, the Taiwanese Air Force ordered 48 single-seat "Mirage 2000-5EIs" and 12 "Mirage 2000-5DI" trainers, with introduction of the first squadron in 1997 and the last fighters delivered in 1998. Taiwanese ordered a set of ASTAC electronic intelligence (ELINT) pods for their Mirages. Republic of China Air Force (ROCAF) has used its Mirage 2000-5EIs in weapons testing and exercises. On 8 May 1998, a two-seat DI fired one MICA missile and successfully hit a target drone 67 km away. It was the first launch of the said missile outside France. The second MICA live fire exercise took place off the east coast of Taiwan on 29 March 2000. On 21 July 2004, two Mirage 2000-5s from the 2nd TFW landed on the wartime reserve runway located at the Jenteh section of Highway No. 1 as part of the annual Han Kuang No. 20 Exercise. 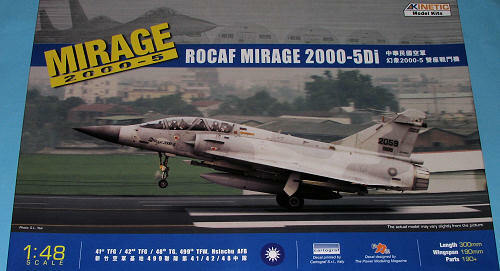 Mirage 2000-5DI 2051, piloted by Maj. Wei-Kuang Chang and Lt. Col. Juei-Chi Duan, and 2054, piloted by Lt. Col. Bin-Fu Wu and Capt. Jien-Liang Chen, took off from their home base Hsinchu Air Base. The two jets landed on the highway then taxied to the other end of the reserve runway to be refueled and re-armed with two Magic air-to-air missiles then shortly took off again. In March 2010 it was reported that the Republic of China had been provided over $3 million worth of parts and maintenance service because of an engine flaw in its Mirage 2000s. The engines had cracks in its blades which caused the air force to reduce flight usage. Typical of modern kits, this one had engraved panel lines and engraved rivet detail. I would equate the panel lines to being softer than what you find on Hasegawa/Tamiya kits, but crisper than what you would find on older Airfix kits like their Buccaneer. In talking with others, it seems like several versions of the M2000 are done, differing only in the sprues needed to do the specific type being kitted. 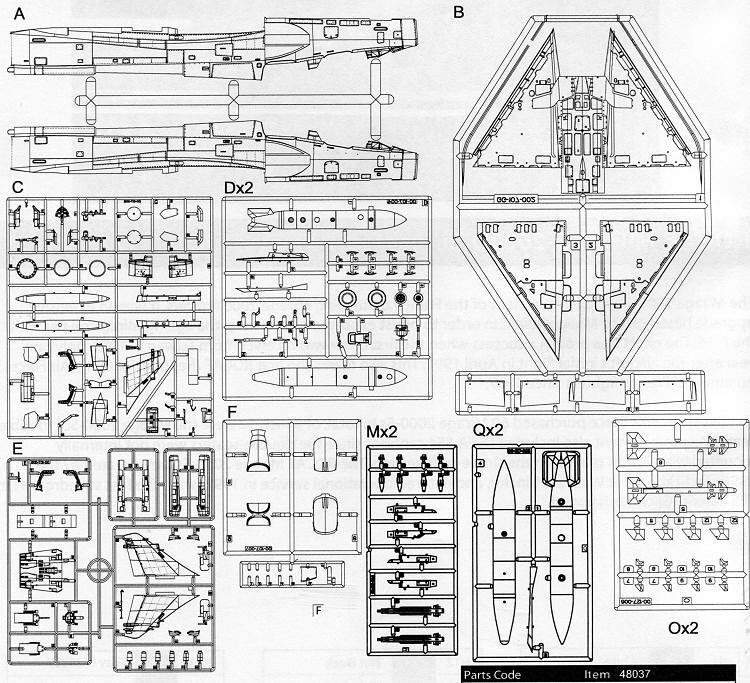 This one has weapons sprues and wing tank sprues that are typical of the ROCAF version. Otherwise, one could do a two seat M2K from just about any nation that flies it if one is not fussy about what is carried under the plane. The cockpit is well appointed and does not use decals for the instrument panels so painting and careful drybrushing will be needed to see detail. The seats are fairly nicely done, though without harness detail, which is pretty typical of most fast jet kits. Resin replacements will really enhance the cockpit. The kit can be built with the canopy raised as there are struts you can install for this. The wings will need attachment holes opened prior to construction so you will need to know what you want hanging from them fairly early in the build. There is nice wheel well detail and the gear is properly complex looking. Gear and doors have retract ion struts and door standoffs. The elevons can be displayed lowered if one wishes and a separate set of actuators is supplied to allow this. Check photos to see if this was a normal way for these aircraft to be sitting while on the ground. The modeler can also choose to have the burner can open or closed. 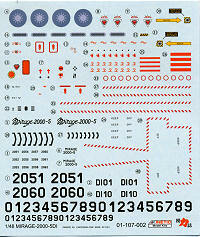 A considerable number of sprues are dedicated to weapons and fuel tanks. There are both centerline and wing tanks available. Weapons include Magic 1 and Magic 2 short range missiles as well as MICA infrared and radar missiles. Instructions are well done with color information provided throughout the build. These colors are referenced to the Gunze line. One can do pretty much any of the two seat aircraft assigned to the ROCAF. The decals are nicely printed and include weapons stencils as well as the usual mass of data markings for the aircraft itself. This looks to be a very nice kit and while the detailing may be a bit much for some, it does not look all that bad to me. It should make a very nice model and one that will look great on your shelf. I got this at the very much missed Great Models.